Lester Trimble Interview with Bruce Duffie . . . . . . . Most of the musicians of at least the past several decades have “doubled.” That is to say they did more than one thing either at different times or concurrently with their main occupation. Performers usually have students of their instrument or their family of instruments; conductors often perform as pianist for solo, concerto, or chamber music; composers usually are also professors of theory or composition or history. 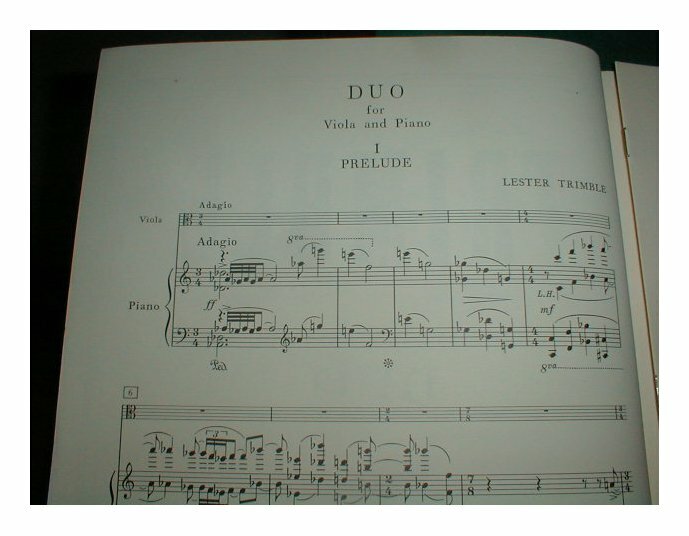 My guest this time, Lester Trimble, was not only a composer and teacher, but also an administrator and a critic. He was the Managing Editor of Musical America (1960-61), Executive Director of the American Music Center (1961-63), and on the Boards of Directors of various musical institutions including the MacDowell Colony, ACA, CRI, the League of Composers-ISCM, the New York Music Critics’ Circle, and the Bennington Composers Conference. All of this after working at the New York Herald Tribune for ten years under Virgil Thomson beginning in 1952, and being music critic for The Nation (1957-62), the Washington Evening Star (1963-68), and Stereo Review (1968-74). In March of 1986, I made contact with Trimble and he agreed to do an interview with me on the telephone. [His letter to me is reproduced farther down on this webpage.] He was thoughtful and upbeat during our conversation, and it is sad to note that he would pass away on the final day of that same year. Here is what was said at that time . . . . . . .
Bruce Duffie: In the biographies about you, they say that you received early encouragement from Arnold Schoenberg. Tell me a bit about that. 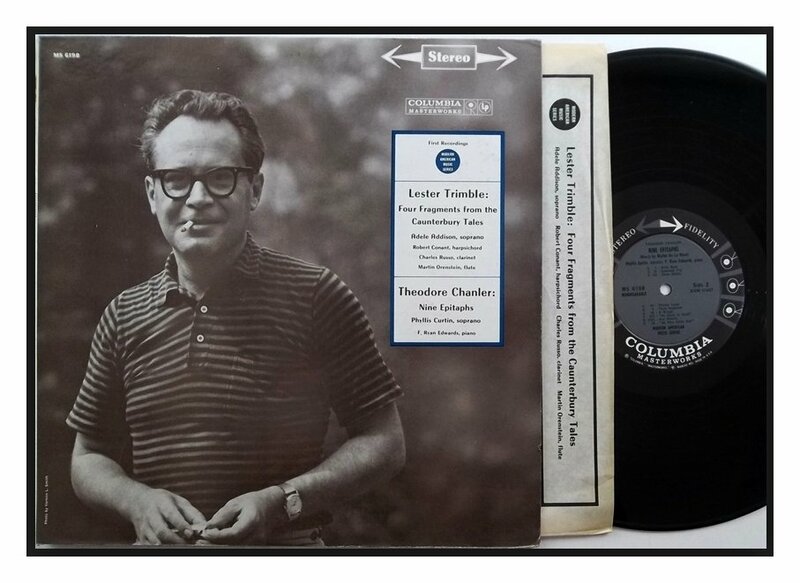 Lester Trimble: Yes. It was a very nice thing. I was in the Air Force at that time, and I got very sick out in Salt Lake City. So they shipped me over to Tucson, Arizona, to be in a hospital, where I was for a long time. I had been composing since I was about sixteen, and before I went into the service I had finished a string quartet. Somehow being out there in Arizona, I suddenly felt as if I was just next door to California. That’s my sense of geography for you. [Both laugh] I got the idea of writing to Schoenberg and asking him if he thought I ought to seriously think about a career in composing. Up to that time I had been a violinist, and I had wanted to compose, but I didn’t know. I hadn’t studied with anybody. So, I wrote to him, and I waited for several months and thought that I would never hear, and then finally, a letter did come. He said, “Send me something.” He had been sick, and that’s why it took so long. So I wrote home and asked them to send the one copy that existed of my string quartet that I had completed. That was long before the days of Xerox, so that was the only copy that existed. I sent it to him, and then I got a very nice letter back from him — which was later printed after his death in the letters that were collected and published [shown at left] — commenting on it. Obviously he felt I should continue to compose, and suggested that after the war was over I come out and study with him. BD: That’s a very generous invitation. LT: Extremely generous! 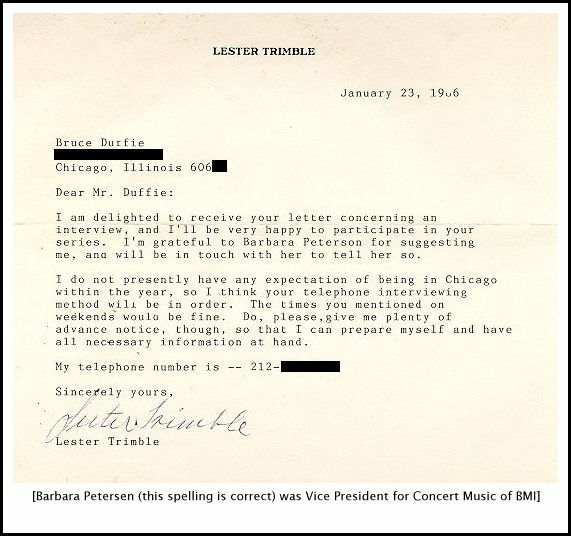 I still have that letter framed and sitting in my studio. It’s one of the most generous letters I ever heard of. BD: When the original letter to you was published, did they come to get the letter from you, or did they have a fair copy? 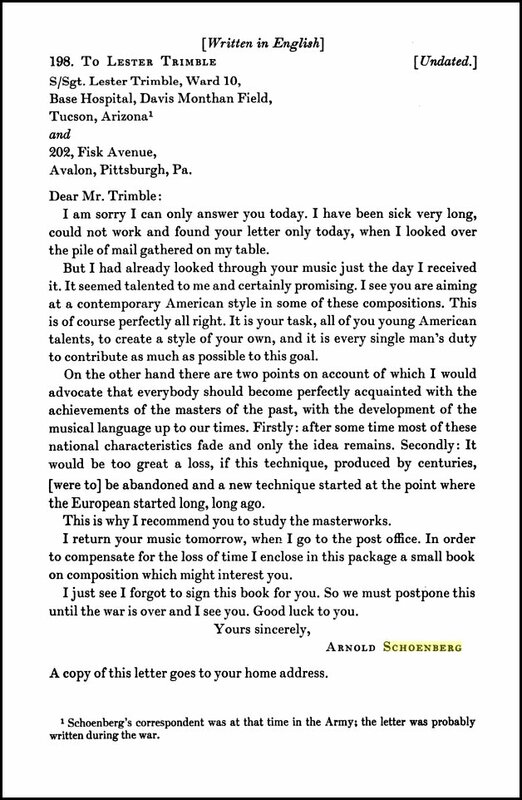 LT: They had a carbon copy, I suppose, from when they were going through Schoenberg’s things after he died. I don’t know, but at that time the musicologist who was doing it was right here in New York. I was writing music criticism for the New York Herald Tribune, so my name shouldn’t have been unknown to him. But anyhow it was, and in the book he said that this letter was to a soldier, that he didn’t know who it was, but that it was unique in the archives of Schoenberg, and therefore he put it in. But it was a wonderful thing for him to do! BD: [With a gentle nudge] Obviously the editor was a Times reader. BD: Did you then take Schoenberg up on his offer to go out and study with him? LT: No. When I got out of the hospital I was in very bad shape with arthritis. They discharged me and sent me home to Pennsylvania. My father had died while I was in the service and my mother was alone, and I was in bad health. I really wasn’t up to going and I didn’t want to leave her, so I stayed in Pittsburgh and went to Carnegie Tech to study, which is now called Carnegie Mellon University. So I never did get out there. BD: You were a music critic for a while. Is this a good job for someone who wants to compose? LT: It is, except that it pays very badly — unless you’re on The New York Times or some newspaper that will actually pay you a salary that’s in line with the Author’s Guild. BD: Was the Tribune not among those? LT: The Tribune was not among those. Virgil Thomson was the critic at that time. [See my Interview with Virgil Thomson.] Of course he was a member of the union, but all the rest of us were simply attached to the paper. BD: You were more than just a stringer, though? BD: [Surprised that this is an unknown term] It’s like being a regular substitute player in an orchestra. You’re called on a regular basis, and yet, it’s not a full-time position. LT: This was a full-time position, believe me — seven to ten concerts a week — but was more like an adjunct at a university in the sense that your duties were continuing and they were mapped out. You were on call. It went on for about ten years, and the personnel was stable; it didn’t change that all much. So it wasn’t just a matter of them calling up and saying, “Hey, will you review this?” You got a schedule every week, and went out and did it. It was good, except that you finally end up hating... well, not hating music, but not quite able to hear it anymore — especially the standard things which are overplayed. BD: I want to come back to the business of choice of repertoire later on, but first let me ask you, what is the role of the critic? LT: I always felt that it should be to explain to the reader what happened at a concert, and to place it in some kind of artistic context and so forth. BD: Is it more than being just a musical reporter? LT: I think it is because it demands much more knowledge of the subject than an ordinary reporting situation. An ordinary reporter has to write about many, many things in which he’s not expert, whereas a music writer is writing about things that he should be expert about. Virgil Thomson was a marvelous boss because he never told you what to do. The only thing he ever said by way of advice was, “Describe it in such a way that the reader will sort of hear what happened.” That was it. He said, “When in doubt, describe it, and if you describe it accurately enough, both your opinion and a description of it will come out.” Not just because I was associated with it but because I think it was true, I felt that in those years that the level of criticism on the Tribune was extremely high — higher than any other paper I knew of. All my colleagues were also composers. That was the one rule. BD: Who insisted on that — the editor of the Tribune, or Thomson? LT: Thomson, yes. He had pretty complete control on that level of things. Nobody really told him how to manage his department, and they supported him in his decisions. They were mostly good decisions, I have to say. BD: How is the level of criticism today? LT: It varies a great deal. I have the feeling, often, that there’s much too much of the personal preferences of the writer involved; that actually it’s a situation in which the writer is listening for a piece that he has someplace in his mind, an ideal, and he is judging everything by how well it does or doesn’t meet up with that imaginary piece, rather than actually listening to a piece and giving it that hearing. BD: He’s telling you what he wished he had heard? BD: What about for the rest of the audience? Does the proliferation of recordings for the home consumer set up an impossible standard for the typical concert-goer? LT: I don’t think so. One thing that has happened in the past twenty years or more, in this country especially, is that the performers have gotten so very, very good, that really, we are all getting, on a technical level, a lot of very good performances by the live groups. BD: They’re technically good. Are they musically good? LT: Well of course that varies. The music often suffers by virtue of the fact that the musicians are working so hard. I mean they’re playing so many concerts per year, and the time factor is so tight that it’s not possible to really do it right. First of all, when they will take a new piece of music and play it, it’s going to be played on one concert series, over a week, say, with the New York Philharmonic or some other orchestra. Then it won’t be played by that orchestra for a long, long time. So they work for a limited amount of time rehearsing it and learning it, and then they play it and then it’s over. Whereas the standard repertory they have been playing since they were teenagers, under many conductors, even. So the standard repertory gets to have a depth of interpretation that very little of the modern repertory, as yet, can. BD: Then this comes back to the question we put off earlier — how can we get more modern repertoire into the big orchestras and opera companies? LT: Well, that’s a tough nut to crack. So long as the orchestras are afraid that the new music will drive away the ticket-buying audience, there’s going to be a problem. A few years back, the American Symphony Orchestra League did a big survey to find out whether, in fact, it was true that putting contemporary music on symphony concerts had a bad effect on the box office. They found that it did not. BD: Was that partially attributable to the subscription series? LT: I’ve forgotten exactly whether that was a factor or not. BD: I would think that if someone is buying a set of eight or ten or twenty concerts, to hear two or three contemporary pieces sprinkled in probably would make very little difference. They would still buy the series tickets and come to the concerts. LT: Yes, if that were the major factor. I’m not sure that it was, though. I frankly don’t remember exactly how they had it broken down, but they really seemed to be coming up with the answer, finally, that it wasn’t anything. It was more than that, but they were trying to find out whether or not people really resisted modern music, and they felt that they came up with the answer: no, they don’t really resist. We just are afraid that they’re going to resist, but then in fact, they’re not. And they checked it statistically from a number of different angles. You couldn’t say that a person would buy a subscription and then give the ticket that night to somebody else, or not even go. BD: But then of course, somebody is going to that concert. BD: Is it better to have one modern piece in the midst of a standard program, or to have an all-contemporary program, or even a program of all one composer’s music? LT: I don’t think programs of all one composer’s music are such a great idea any time. I never have, all my life. I remember, at a certain period when I was growing up there used to be all-Brahms concerts. I know my violin teacher was a Brahms addict. We played string quartets together, and he would invite people over and we would play larger Brahms chamber music. We didn’t play only Brahms, but he always wanted to play Brahms if possible. I got so tired of a concentration of the one composer that I decided that the program with some variety on it was a much, much better idea. It’s quite a burden to put on any one composer’s back — whether he’s dead or alive — to carry an entire evening of music. BD: Is that one of the reasons why an opera is so much more difficult to put across than a symphonic program, because the burden is resting just on the one composer, and the one librettist? LT: Gee, no. I doubt that. I doubt that’s the reason. Is an opera harder to put over? BD: I just wondered if there was any corollary between the two. LT: I doubt it. With a symphonic concert, for instance, if you play three Brahms symphonies in one evening, you’re having three pieces with four movements each, and each movement is very structured formally. The whole thing structured formally. You hear the first symphony and that’s a great piece, and then you hear the second and you start to listen again to his formal structures and his style, and by the time you get to the third, you had an awful lot of that one style and that one concept of structuring and so forth. Whereas with an opera, you have the story and the drama on stage, and the story isn’t finished until the last act. So it’s not quite the same thing as listening to a series of movements. It’s just that each one is shaped individually. You go through the one piece, and then you have to go through another. BD: You mentioned three Brahms symphonies, but it would be the same if it were all Brahms — an overture, a symphony and a concerto? LT: Yes, I think so. Actually the all-Brahms programs I remember would be something like that. They’d have a concerto on there as relief. But of course it’s the same style and the same concept of how one goes about composing. BD: Let me flip the coin. Does it not put too much pressure on the contemporary piece to try and stand between, say, a Mozart, a Haydn, and a Beethoven on the same concert? LT: I think yes, it does put a burden on it because it’s the only thing that’s different. The standard styles are known to almost anybody who goes to concerts. Nothing is going to be unfamiliar. If you start with Vivaldi and go up to Wagner, it’s all going to be somewhat foreknown. But the modern piece, the contemporary piece, will be an unknown quantity, and may be a style the people have never heard. The problem is that we are so scanty with the amount of contemporary music that we put on concerts that we always come back to that same thing. There’ll be four or five pieces, and then one will be contemporary, maybe. BD: But if that was the pattern, if every third concert you went to had a new piece, then it would be much more familiar. LT: Then it would be, yes. BD: Does the burden then rest with the conductor, or the management of the orchestra, or whom, to put more contemporary music into the revolving repertoire? LT: From what I have observed and heard, that seems to be another very complicated problem. The conductors, many of them, say that they would like to play more contemporary music than they do, and that other forces in the organization or the symphony hold them back; that they’re sort of discouraged from doing that. The amount of interest on the part of any single conductor varies from man to man, and that’s normal. BD: But it seems to be very rare that you get someone, such as Koussevitzky, who is very interested in pushing young pieces. LT: Yes. That really seems to have been unique, unfortunately, and it accomplished an awful lot. But he was a man who, from what I know, had complete control of the situation. His board of directors gave him carte blanche, and if somebody said, “I don’t like that piece,” he said, “Fine. I’ll play it again. Maybe you’ll like it better.” [Both laugh] But he was unique. He managed to get quite a bit of twentieth century music launched into the repertory. BD: Is it a mistake for both public and managements to expect a new piece to be a masterwork? LT: I think so. We’re much too focused on things in capital letters. Erich Leinsdorf wrote an article in The New York Times speaking about conductors. [See my Interviews with Erich Leinsdorf.] I think it was last Sunday that it was printed, and one of the things he said toward the end was, “We’re not stand-up comics,” by which he meant our purpose in performing is not to get a boffo laugh, a boffo response on everything we do; that if everything has to be the big, big response, then that’s an awfully hard thing to accomplish. If you think about the Beethoven symphonies, are they all masterpieces? BD: There are a couple of weaker ones thrown in, but even the weak ones tend to be stronger than many of the other things we often hear. BD: Would it be, perhaps, to the contemporary composer’s advantage to load up a standard program with weak standard works, and then put the contemporary piece in it? LT: I don’t think that, either. I’ll say this, and this is something that my years of reviewing convinced me of, and that is that good music will get through to the perceptions of an audience, no matter what epoch it’s from. Audiences are ‘frightenable’, or they’re maybe just frightened of new things, but if a piece is truly good music, it will very likely get through to them. I think that they instinctively also know when a piece in a traditional repertory style is a weak piece. I don’t think most people could tell you, “I don’t like that because it’s a weak piece.” They would just say, “Oh, that’s nice,” but they would be dissatisfied. So putting weak pieces on programs is not a good policy from any point of view. BD: What do you as a composer expect of the public? BD: Then what do you hope for? LT: Receptiveness, non-frightened-ness, willingness to relax and listen and give the piece a chance, not to reject it out of hand before they really have heard it through. BD: You’d expect them to understand it on first hearing? LT: No, not necessarily. I remember as a kid the first time I heard a Bartók string quartet. I wouldn’t say I understood it, but I very surely was aware that there was something there. BD: So you had a positive reaction to it? BD: Is this part of the role of the critic, then, to get the public’s hearing apparatus on straight? LT: It’s part of his role to help them, and to help the whole situation, to help the whole culture. That’s an important part of his role. BD: The kind of music that you write and the kind of music that we hear in concert halls and in chamber ensembles, is it art or is it entertainment? LT: It’s art. There’s no question in my mind about that, but saying that doesn’t mean that it has to be less than entertaining and less than appealing on many, many levels. BD: I’m looking for your idea of where the balance should be. LT: I don’t think one can say. That’s up to the composer to make that decision, where the balance has to be. Hopefully some other people will feel that he has made a right decision as to where the balance is. BD: When you’re writing a piece, do you write for a specific public, or do you write for yourself, or do you write for the players, or for whom do you write? LT: I write for an imaginary public, a specific imaginary public, who has all the attributes of being willing to take the music on the level that it is handed to them, and try to relax and enjoy it. But that’s, of course, an imaginary audience. You never know. If you tailor it to a specific kind of audience, then you’re doing what a Broadway composer has to do. He knows who he thinks his audience is going to be and what they want to hear, and tries to provide that. For the most part that will be entertainment, and that’s perfectly legitimate, but I don’t think that’s the function of art. So it’s not quite the same thing. BD: When a piece of yours is being rehearsed and performed for the first time, or even for the tenth or twentieth time, do you find that conductors or performers discover things in your piece that even you didn’t know were there? LT: That doesn’t happen very often. It could happen under different circumstances, but under the kind of rushed circumstances that we all work under, where you’re going to have very limited rehearsal time before a concert, it’s not likely that the conductor or the performers are going to discover anything you don’t know is there already. If you had more performances and rehearsals, then they definitely would. Take for example the Beethoven works. You can play them all your life and still discover things that you didn’t really fully know were there. So there is a lot to be discovered. I have no doubt that there is in my music, and my colleagues’ music, too, but they’re not being played consistently enough so that a conductor can say on the thirty-fifth time he’s played a piece, “Oh, my goodness! I never quite noticed this before. Let me try this,” and make a slightly different emphasis somewhere, and thereby bring about quite a change. BD: Is this, perhaps, what delineates great music from ordinary music, the amount of depth that is built into it? LT: I think it’s what differentiates a great performance from a routine one. BD: So then the burden is on the re-creative side, rather than on the creative side? LT: To answer your question about the music is kind of hard, because there again, different composers have always aimed at different things. With a Germanic kind of expressive music, there was always an aim for some kind of philosophical profundity. I don’t know if that always was the aim with French or Italian music. So if you try to say that it’s something that has to be present in all music, I’m not sure that is necessarily true. Maybe it is, but... Do you see what I mean? BD: I think so. Is there any competition among composers? LT: Oh, wow! [Laughs] Yes. Yes, there has to be. It’s a situation where there are too few performance opportunities, and a great many composers composing, and very little of our music being played, orchestral music, anyway. BD: Are there, then, too many composers? LT: No! There’s too little performance! [Both laugh] Not a bit. You can’t have too many composers, if they’re good. BD: You’ve done quite a bit of teaching in your career. BD: Is the study of composition, is the craft of composition, something that can be taught, or must that be learned intuitively by each young composer? LT: It has to be learned intuitively by each young composer. It cannot be taught in an intellectual sense. Though some teachers try to do it, you cannot say to a student, “Now, you must do this in this way,” because if you do that, you freeze up and stultify the creativity of the student. But if you’re willing to fatigue yourself quite a bit in the process, you can project into their ideas and help them to bring them to full blossom. That, in a way, ends up being a kind of a teaching process, because you can guide them without necessarily pushing them too hard in any one direction, stylistically. BD: So then it’s not really teaching them what to do, but how to use what they have? LT: Yes, although what they have may be at that point something that’s only visible to you. But ultimately, outside of the strictly technical aspect of things, the materials of music, the formative part of it has to somehow come out of the creative spirit of the young composer, the student. What the teacher can do, intuitively or otherwise, is to figure out where this particular talent is trying to go musically, and to help it to find its way. BD: Have you observed any big changes in young composers over thirty or forty years? LT: There was a big change about twenty-five years ago — in this country, anyhow. At the time when Stravinsky changed over to the twelve-tone method of writing under Robert Kraft’s suggestion, there was a beginning of a large movement in that same direction in this country. For a long time that style became the norm for contemporary music, and it was very difficult for any composer not to go along in that direction. He was very likely not to be performed if he did. That lasted pretty steadily up until just a very recent few years ago, when suddenly there seemed to be a great fatigue with it, and all sorts of other things began to happen. BD: Is it a good sign that music is still growing? LT: Oh, I think it is. I feel sure of it. Actually, music has always changed from the earliest unrecorded times, I’m sure. The one thing that was odd about this was that it was so static for such a long period of time. That seems to be odder than that there should be a change now. LT: I don’t really know. That’s pretty hard to predict. BD: Is that a new phenomenon, that we are at a point now that we don’t know where music is going, or is it always that we never know where it’s going; we always know where it has been? LT: We always know where it has been. [Wryly] If we knew where it was going, there would really be no need to go to a concert hall to hear a new piece, because we would already know what it was going to be. [Both laugh] The whole element of surprise would be gone. Music is a very flexible substance. It has always changed. If you look back through all periods of history, there have been numerous nuances of style going on simultaneously. For instance, in the time of J.S. Bach, his sons were already writing a music that was on the brink of the Classical, Mozartian/Haydnesque music that came very shortly afterward. So I think our notion that there is a particular style in a particular period is a false one that we get from reading history book labels, or musicology labels and about “periods.” Music is always in a changing condition. BD: So in an idealistic sort of situation it would be wrong to say that no music less than twenty-five years old can be pigeon-holed? BD: Maybe let me revise my suggestion and say that no living composer should have any kind of label attached to him until you can see the whole body of the work. LT: Actually that’s not a bad idea, come to think of it, but this is where Virgil Thomson’s admonition come in, “When in doubt, describe it.” The description is usually better than just giving a label. It leaves it a little opener. Thomson’s an incredible guy. He really is! I think he’s the brightest man I ever have known in my whole life, just for keenness of mind. BD: Let me ask you about your opera, Boccaccio’s Nightingale. LT: That’s a piece that’s very close to my heart, though it’s never been performed yet. Before I wrote that, I wrote a piece called Four Fragments from the Canterbury Tales, which was a setting of a sort of a little cantata, set in Middle English, from four large excerpts from the Canterbury Tales for soprano, flute, clarinet, and harpsichord. I really wrote that piece as a practice piece, because I knew I wanted to write an opera and I was afraid to begin. So I thought I’d just sort of warm up on that. It turned out very successfully, and has gotten a lot of performances over the years, and a recording [shown below]. By then I had got my nerve up to start the opera, and Boccaccio’s Nightingale is based on a story from the Decameron. It’s essentially a kind of a happy Romeo and Juliet story, in which two young kids fall in love. Their parents try to keep them apart, and they’re unsuccessful. So despite all the fussing around of the older folks, and despite the fact that there’s a middle-aged count who wants to have the girl, the kids are discovered in bed together one morning, and the whole thing blows into the stratosphere. The priest is called. They’re married, and there’s a wedding on the spot! It’s an entirely happy opera, but I hope someday I can get a performance for it. That’s the only problem. BD: Obviously you did not write this on commission. It was just something you wanted to do? LT: Yes, it was just something I wanted to do. Actually, I’ve done that with more music than I should have, because as you get on into a career, you realize that you can end up with a major expenditure of time on something that is going to be very hard to get a performance for. Whereas with a commission, you know that the performance is implicit because somebody’s told you they want the piece. BD: Then why opera? What attracted you so much to opera that fascinated you, and you wanted to do it? LT: Actually that’s where the music reviewing played a part. I first started writing criticism when I was still in graduate school in Pennsylvania. Then when I came up to New York, after I’d been in Paris for a year, Thomson gave me the job on the Tribune. I began right away, but I hadn’t seen very much opera because it just wasn’t available. Occasionally I’d come up to New York to go to the opera, but it was a very rare event. Then when I suddenly had to cover a lot of opera, I had to do a lot of studying and thinking about it, and I suddenly realized that it’s a fantastic musical expression that you really only understand if you are sitting in the audience. It is really very hard to understand opera just listening to records. It is a complete dramatic phenomenon that very seldom comes off. When it does, it’s fabulous, but there are so many working parts. One or the other is very likely to be out of joint on any given evening, but when they’re all functioning, it is spectacularly wonderful! After a few years of that, I decided that even though I never had before thought of it, this is something I want to do. BD: I assume you would wait for a performance of the one before attempting another one? LT: Oh, yes! [Laughs] Yes, indeed. That was a five-year period of work, and there it sits. It’s a very complicated thing to try and get a performance of an opera, because they’re so expensive. There again the same situation prevails, that in order to pay the huge expenses of the opera houses, they have to fill the seats. BD: If you saw it done on stage, would you be likely to tinker with it a little bit, make a revision here and there? LT: I would expect to. BD: This opens a can of worms that I always like to ask living composers. There seems to be this school of thought now to go back to original versions. Once you’ve revised a work, do you wish then the original version be destroyed and never used, or how do you view it? LT: If the revision is really a genuine revision, I’d rather the original not be gone back to. BD: Is there a difference between revision and adjustment? LT: Yes. If it’s a really a serious re-thinking of something on the composer’s part, I’m not so sure it’s fair to him — especially if he’s dead — to go back and obliterate his second thought. But if it’s just something like lengthening or shortening an aria, or some superficial thing like that, I don’t think it matters. BD: I always like to ask this of living composers, because there seems to be this great desire on the part of musicologists to go back to original versions, and even search through composers’ waste baskets and start performing those ideas. LT: Yes. [Laughs] In some cases, maybe... the only one that comes to mind right away is Mussorgsky. BD: But that’s a little different because it wasn’t his revision. That was somebody else taking and tidying up his score, mostly Rimsky-Korsakov. LT: Right, and that what’s been happening — Rimsky and then Shostakovich, too — with Boris Godunov. Just in recent times, the tendency is to go back and use the original Mussorgsky, and people found that they preferred it, and I think with justification, probably. That’s not unique, but it’s slightly grayer. BD: Are you, for the most part, basically pleased with the recordings that have been made of your works? BD: Why does that surprise you? LT: Because no matter how good they are, you always project that, oh, if the conductor had just done this or had just done that, it would have been more to my taste. You don’t very often, in this country, have that much control over it. Like my First Symphony, I have a recording I’m very pleased with. It’s very nice, but it was done by Howard Mitchell of the National Symphony Orchestra some years back, and I was absolutely amazed at how much more expansive the piece sounded than it does on the recording which was made with a Japanese Orchestra in Tokyo, and a Japanese conductor. It’s very good, but it is not a big American orchestra with an American conductor, who seemed at that time to understand what I had put down in a different way. I was so much more pleased with that particular performance, but nevertheless, the one on the recording is very nice. BD: Have you done some conducting of your works? LT: I’ve done some, not a huge amount. BD: Are you, then, not the ideal conductor of your works? LT: No. I don’t think I would be, not for an orchestral work, anyhow. Unless a composer is able to have a lot of experience with the orchestra, I never felt that he’s likely terribly, terribly ideal, even though it may make a difference between getting a performance and not getting a performance. I never even felt Stravinsky was the ideal conductor for his music, personally. It seemed to me I heard many much better performances of his music by really professional conductors. Nevertheless, I’m sure historically speaking, that one can say those are authentic. That’s what he wanted. But I’d rather have a good conductor bring his own accumulated skills to lend them to me for the time of my piece, than try to do it all myself. BD: Even when it’s just two or three days for a couple of rehearsals and three performances? LT: Especially then! [Laughs] Especially then because he knows how to do it in three rehearsals. I certainly wouldn’t. BD: He’d get more out of it in those three rehearsals? LT: Yes. It takes experience of a certain kind to be able to do that, and I wouldn’t have that experience. BD: Do you feel that you are at the mercy of the performer or the conductor? BD: I hope mostly they do you proud! LT: Mostly they do you proud, yes, but your music and your nerves are in their hands when they’re doing it. They’re very important. They’re very important! BD: Is being a composer fun? LT: The composing is lots of fun. There are many things about the professional career aspects of composing that aren’t fun at all, but the composing is lots of fun. It’s hard work, but it’s terribly interesting work. BD: So it’s the peripheral material that’s not really composing that becomes burdensome to you? LT: Yes. It takes a great deal of effort to do all the things that are necessary to find the right performer for a given piece and the right place for it to be performed, and to oversee the whole process of raising it up in front of an audience. That’s a very complicated sort of proposition that doesn’t have very much that’s fun about it. BD: But you have to do it. LT: But you have to do it, surely. Yes. It’s very much what a playwright probably experiences. Writing the play would be lots of fun, but all the complicated planning and maneuvering to bring that thing into a performance, with actors and directors and producers and backers and so forth, in front of an audience, is a different kind of work, and I don’t think for creative people, for the most part, it’s a lot of fun. Some creative people have a gift for it and I suppose they probably enjoy it, but those of us who don’t have that kind of gift don’t enjoy it. BD: Are you ever surprised that your music is performed in certain places? Does it come as a surprise that they did something? LT: Yes, very often. I’ll get a letter from somebody and they’ll say, “We performed such and such a piece.” It’s always a surprise, and always a great, great pleasure! Here am I sitting, working away on whatever I’m working away on, and all of a sudden I’m told that, my gosh, without my knowing it, this was going on way out there in Kansas or Minnesota or California or Vermont, and that’s always exciting. BD: So then you’re not aware at all of the things that are being done? LT: Much of the time not, no. Unless somebody lets me know, I won’t know. There’s a lot goes on that I don’t know until I go down to get my statement from Broadcast Music Incorporated, and they give me a rundown on what radio broadcasts there’ve been, for instance. But there are performances of chamber works that take place, and unless somebody happens to write to the publisher and tell them that they did it, I may not know about it. So it all very accident-prone, you might say. BD: What is next on the calendar for Lester Trimble? LT: A very nice thing. I’m just now proofreading the score to my Third Symphony, which was commissioned for the tricentennial of the city of Albany. The celebration is going to start this September, and my piece will be on the first concert. It will be performed several times, and then immediately recorded [see CD booklet cover above]. So that’s very happy-making, and I’m very happy with the piece. I’ve been working on it for a year, and I’m just very thrilled with it myself. After that I’m not quite sure. I’ll just be working hard until September for that, but after that I haven’t quite decided. BD: I wish you lots of luck with the new symphony, and with everything else that is coming up. It’s been lovely talking to you. LT: It has for me, too. Lester Trimble, a composer, critic and music teacher, died Wednesday afternoon [December 31, 1986] of heart failure. The 63-year-old composer, who had had a heart condition, collapsed shortly after noon in a restaurant on Broadway and was dead on arrival at Roosevelt Hospital. Mr. Trimble composed symphonies, chamber works, operas and songs. He received honors and commissions from symphony orchestras, foundations and music societies. Mr. Trimble's Symphony No. 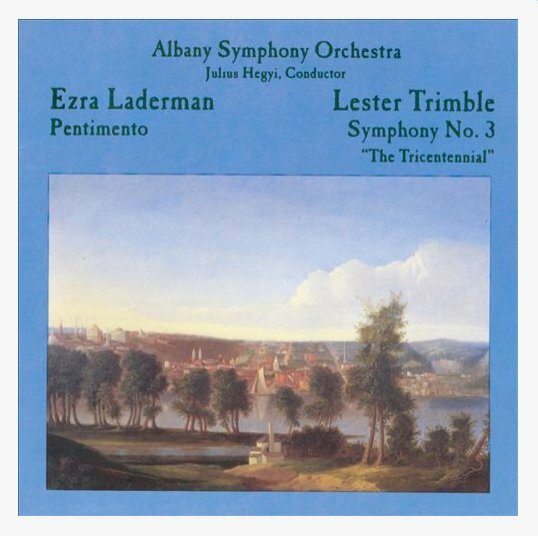 3, ''The Tricentennial,'' commissioned for the City of Albany's 300th year, was given its premier performance last September by the Albany Symphony Orchestra. Last January he received an honorary doctorate from St. John's University at its commencement, for which he composed the processional music. 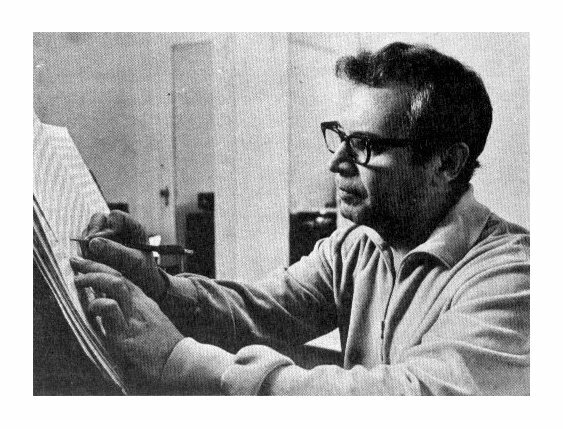 Among his best-known compositions are his Second Symphony (1968), which is based entirely on elements from a single lyrical theme, and a series of works he called ''panels,'' which are for diverse instrumental ensembles. Born in Bangor, Wis., on Aug. 29, 1923, Mr. Trimble's musical training was acquired largely at the Carnegie Institute of Technology. After service in the United States Army, he studied at Tanglewood, where he met Darius Milhaud, with whom he subsequently studied in Paris. Settling in New York after returning from Paris in 1952, he was the music critic of The Nation, a music reviewer for The New York Herald-Tribune, managing editor of Musical America and executive director of the American Music Center. 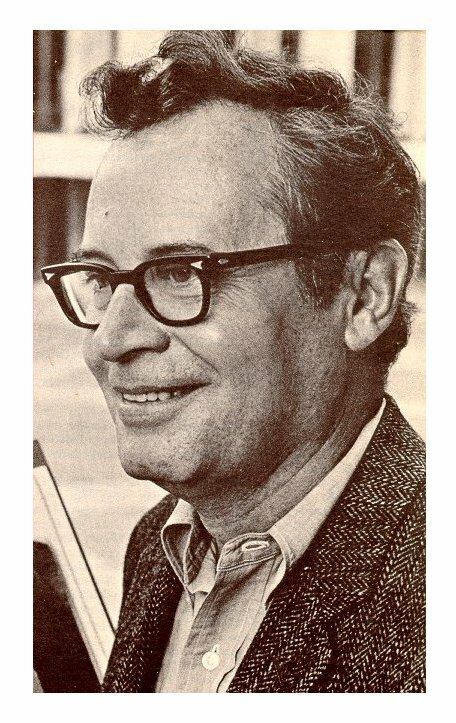 He was professor of composition at the University of Maryland from 1963-68 and composer in residence with the New York Philharmonic from 1967-68, and he joined the Juilliard School faculty in 1971. In 1973 he became the first composer in residence at Wolf Trap Farm Park. He taught privately the past two years. Mr. Trimble is survived by his wife, Constance Wilhelm, of Manhattan, and a brother, John R., of Massapequa. Funeral services are private, and a memorial service will be announced. This conversation was recorded on the telephone on March 22, 1986. Portions were broadcast (along with recordings) on WNIB later that year, and again in 1987, 1988, 1993, and 1998. This transcription was made and posted on this website in 2014.